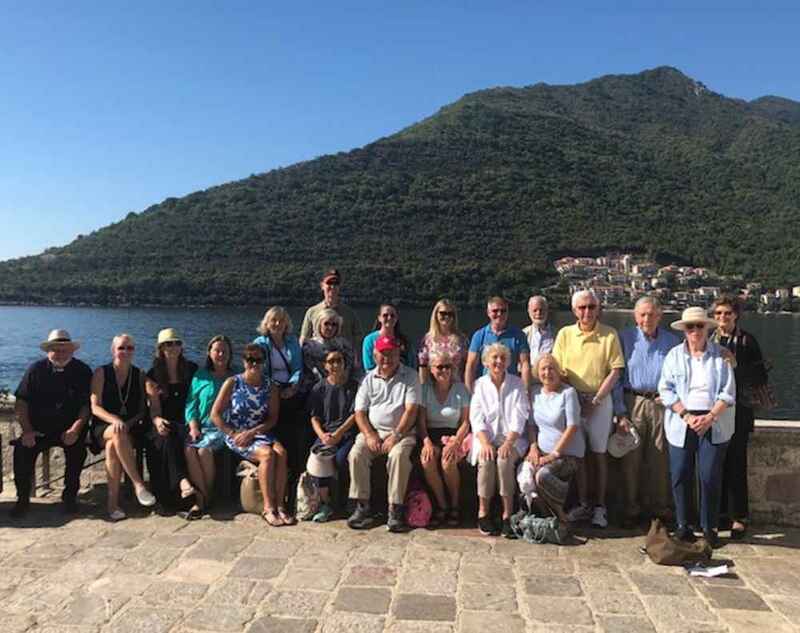 In September, Federal Association President Margaret Melady led a pilgrimage of 22 members of the Order to Croatia, where we were warmly welcomed at a dinner hosted by Croatian Catholics and experienced first-hand how the country has recovered from the 1992-95 war that followed the breakup of Yugoslavia. We were blessed to visit several Catholic churches and shrines, including the National Shrine of Our Lady of Bistrica with its Black Madonna, the cathedrals of Zagreb, Zadar, Sibenik, and Split, and the Church of St. Blaise in Dubrovnik. Some days, we joined local Catholics at Mass, and other days worshipped privately, led by our pilgrimage chaplain, the Rev. John Tetlow from Jacksonville, FL. Every day, we enjoyed beautiful scenery and the company of members from all over the Federal Association. From the UNESCO world heritage city of Dubrovnik, we made a day trip to pray at Medjugorje. A highlight of the pilgrimage was another day trip, this one to Montenegro where we visited the aptly named Our Lady of the Rocks church built on a man-made island. We continued to Kotor to one of the two Catholic churches in Montenegro, the Cathedral of St. Tryphon, where the bishop not only welcomed us but also served as an acolyte at our private Mass. Near the end, we visited the ancient Byzantine icon of Our Lady of Philermos, named for a sanctuary in Rhodes. The Order possessed the icon when the Order was headquartered in Rhodes in the 14th and 15th centuries and later when the knights took the icon to Malta, where it was venerated during and after the great siege of 1565. Today the icon is reverently housed in a museum in the Montenegrin city of Cetinje. After each of us venerated the icon, we visited the Orthodox Monastery of St. Peter where the monks, knowing that we were members of the Order, generously allowed us to venerate the relics of John the Baptist and a fragment of the Holy Cross, both of which were once owned by the Order. We returned home, after nine glorious days, more deeply aware of how blessed we are to be members of the Order of Malta.